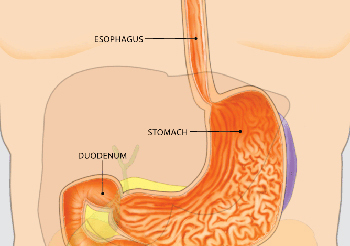 The esophagus is a muscular tube that connects your throat to your stomach. At the lower end of the esophagus, a valve (a special sphincter muscle) remains closed except when food or liquid is swallowed or when you belch or vomit. Esophageal pain, heartburn, and/or difficulty swallowing are often caused by abnormalities in the contractions of the esophageal muscle or abnormalities in the sphincter at the lower end of the esophagus. What is esophageal testing, also called manometry, and why is it performed? Esophageal testing or manometry measures the pressures and the pattern of muscle contractions in your esophagus. Abnormalities in the contractions and strength of the muscle or in the sphincter at the lower end of the esophagus can result in pain, heartburn, and/or difficulty swallowing. Esophageal manometry is the test used to diagnose the conditions that can cause these symptoms. How should I prepare for esophageal testing? An empty stomach allows for the best and safest examination, so do not eat or drink anything for 6 hours before the test. Since many medications can affect esophageal pressure and the natural muscle contractions required for swallowing, be sure to discuss with your healthcare professional each medication you are taking. Your doctor may ask that you temporarily stop taking one or more of these medications before your test. What can I expect during the test? A healthcare professional will apply a cream to numb the inside of your nostrils. Then a thin, flexible, lubricated tube will be passed through your nose and advanced into your stomach while you swallow sips of water. Mild, brief gagging may occur while the tube is passed through the throat. When the tube is in position, you will be sitting upright or lying on your back while the tube is connected to a computer. Once the test begins it is important to breathe slowly and smoothly, remain as quiet as possible and avoid swallowing unless instructed to do so. As the tube is slowly pulled out of your esophagus, the computer measures and records the pressures in different parts of your esophagus. During the test, you may experience some discomfort in your nose and/or throat. The test will take approximately 30 minutes to complete and the results will be sent to your doctor's office. What can I expect after the test? After the test, you may experience mild sore throat, stuffy nose, or a minor nosebleed; all typically improve within hours. Unless your physician has given you other instructions, you may resume normal meals, activities, and any interrupted medications. What are the possible risks associated with esophageal manometry? As with any medical procedure, there are certain risks. While serious side effects of this procedure are extremely rare, it is possible that you could experience irregular heartbeats, aspiration (when stomach contents flow back into the esophagus and are breathed into the lung), or perforation (a hole in the esophagus). During insertion, the tube may be misdirected into the windpipe before being repositioned. Precautions are taken to prevent such risks, and your physician believes the risks are outweighed by the benefits of this test. What if the tube cannot be passed? In some situations, correct placement of the tube may require passing it through the mouth or passing the tube using endoscopy (a procedure that uses a thin, flexible lighted tube). Your physician will determine the best approach.